Percy Petter explained the beginnings of Westland in his memoirs "By the beginning of 1913, the whole of the three acres of land at Reckleford which had originally been my father's garden, was occupied by buildings and necessary yard spaces (the Nautilus Works); yet it was necessary at times to work night and day in order to supply the ever-increasing demand for Petter engines." He was persuaded by the manager of his foundry to inspect a field off West Hendford which sloped gently up from the Great Western Yeovil & Taunton branch railway. Enquiries were made into the ownership of the land and the possibility of getting sidings on the railway. The land was purchased, together with some seventy five acres of farmland to the north of the works for a proposed 'garden village' of houses and amenities for the anticipated huge increase in Petter employees. Percy continued "Mother and I with Norah and Kathleen had gone down one Saturday afternoon in 1913 to cut the first sods for the foundations of the new Foundry and mother chose the name Westland, which has since become famous all over the world. The new Foundry, one of the largest in Great Britain, was ready for occupation early in 1914 and the first casting was poured." Westland Road ran from the crossroad junction of West Street, Orchard Street and Beer Street and terminated at the Westland works. Westland Road, together with the section of Seaton Road north of Westland Road, were completed by the early 1920s. Most houses were constructed around a series of small culs-de-sac to engender an intimate village atmosphere while the wide road was planted with trees along its length to reinforce the feel of a leafy 'garden village'. Initially the address of the houses along the southern side of the road were named Westland Terrace, while the addresses of properties along the north side were known as Westland Road, this naming convention continued until at least 1947, after which the whole road became known as Westland Road. 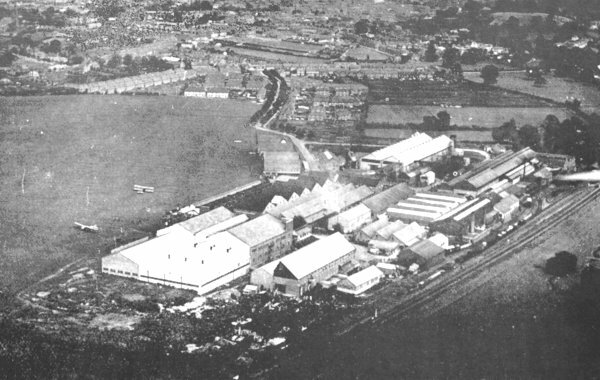 An early post-First World War aerial view of Westland Ltd. Note that the houses had been built in Westland Road, at top centre, in what was intended to be a 'garden village'. Many trees were planted along the road, seen here as dark stripes either side of the road, to enhance the 'garden village' feeling. 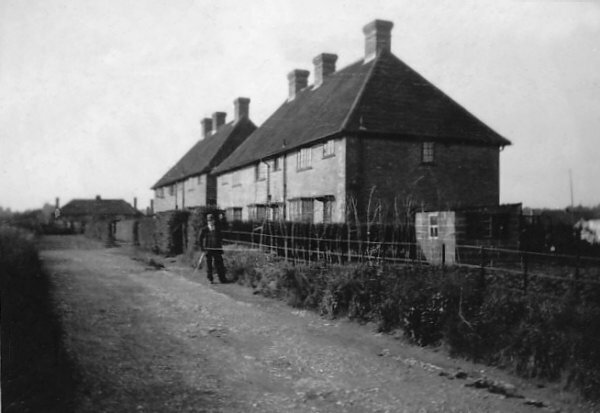 An enlargement of part of the above photograph showing, at left, the two blocks of three houses known as 'the White Houses' and seen in the following photograph. The White Houses of the previous photograph. Before the renumbering of Westland Road, Yeovil Directories listed the postal address for these houses as 1 to 6 The Aerodrome in 1938 and 1 to 6 The White Houses in 1947. By 1949 they were renumbered to 94 to 104 Westland Road. 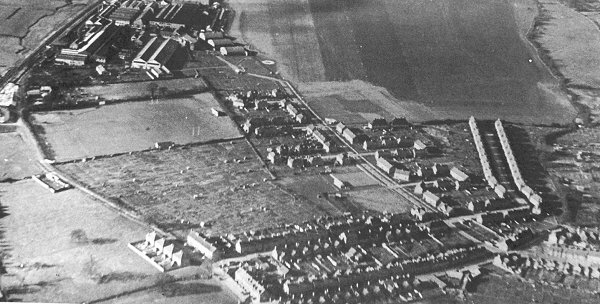 This aerial photograph dates to 1930 and shows the length of Westland Road, from its junction with Beer Street and West Street at extreme left, to the Westland complex at right and the airfield dominating the lower half of the photograph. This is a an aerial photograph of Westland Road at centre right - note the absence of trees lining the road which were, apparently cut down during the late 1930s. 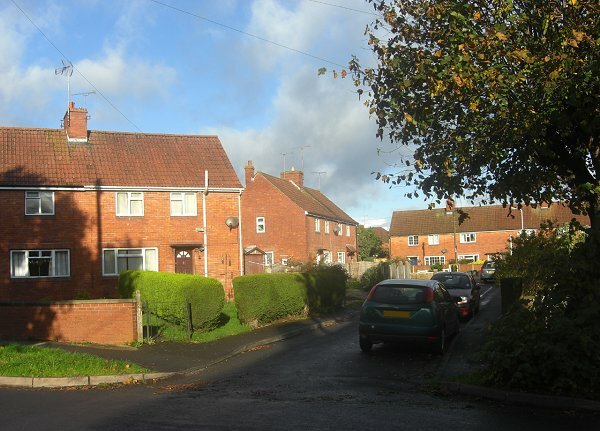 This clearly shows how the houses were built around a series of culs-de-sac to produce an intimate 'garden village' feel that was later enhanced by extensive tree planting. At top left is the Westland complex with West Hendford - at this time only a stony track - running across the left corner. Seaton Road and Beer Street dominate the bottom centre with Orchard Street in the bottom right corner. On the very left edge of the photograph the white buildings were a stoneworks, just below that, what appears to be a rectangular enclosure was a greyhound kennels. On the opposite side of West Hendford, facing the back of Seaton Road are allotments and the field between the allotments and the Westland factory complex was the Somerset County Cricket Ground. A typical Westland Road cul-de-sac, photographed in 2014.